At AHS monitoring we have been specialising in 2-way voice communication alarms making us the most experienced monitoring station in this field. The AHS Staff Safety range is pushing back the boundaries of what’s possible in monitoring your employees’ Health & Safety. It combines our technology with a bespoke service, designed to meet the particular needs of your business and your staff. The AHS Staff-guard system really does make a difference. It puts your most valuable asset “The Staff” at the very heart of our monitoring technology. AHS Staff Safety provides a high quality speech link to our monitoring centre, so we can listen to any developing situation and determine the action to be taken. For example, police can be alerted to a gun threat and the need for an armed response unit. The live 2-way speech system works both ways, allowing the fully trained staff at the monitoring station to assess and assist your staff in difficult situations. For example, when verbal harassment or abuse is occurring within your premises we can, at great volume, advise the irritants to ‘leave the premises immediately’, interact with them in real time and respond to the situation as it develops. Silent mode also allows us to listen in and assess before we act where in some situations silent alarms are necessary. Every situation is unique and not every threat can be anticipated. AHS Staff Safety is an adaptable system that is set up to fit the needs of each individual business . The monitoring station can assist staff by calling for an ambulance when a staff member or a customer has collapsed or is in need of urgent medical assistance. We also have the facility to stop staff walk-outs by facilitating next-day installation of the AHS Staff-guard. Our aim is to defuse the situation and to protect the staff from physical abuse,alerting the authorities to the situation as it is unfolding. The Staff-guard itself is a panel which is placed in clear view for all to see it has a long range speaker and microphone built in and we can also fit more speakers for larger premises. It will be fitted to existing telephone line, although GSM units are also available for units with no telephone line and are ideal for mobile units such as catering stands etc. The cost of the equipment will depend on the customer requirements and is surprisingly less than you would imagine with your typical shop with 3/4 staff coming in under £190 and monitoring costs are pennies per day. 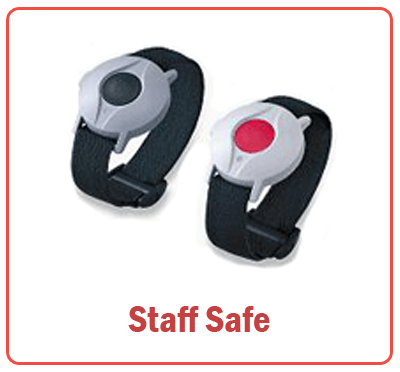 Worn as either a wristband or a pendant, most of our clients pop the alert on in the morning, take it off at night and don’t give it a second thought unless they need to call for help. A few of our clients use the Staff-guard system in slightly different ways so we can monitor their well-being and their movements using a log-on / log-off method. If you’re unsure about how you want to use your Staff-guard system, contact us to have a chat about how a Staff-guard system can fit around your life.